The Hague was the second of two Dutch cities to open a Demonstration Cycle Route in the late 1970s. Two weeks ago I wrote about the Route in Tilburg where people generally liked it and some were even proud of the route. In The Hague the story is quite different. Especially the shopkeepers in this city did not respond well to the cycle route. They even took matters in their own hands, literally! While the route in Tilburg was completed in just 19 months, the route in The Hague was only half built. Public participation was part of the decision-making process in The Hague and that took so long that the city lost the right to the Government subsidies. This meant the final half of the route was never built. The route in Tilburg is still mostly there but even of the built route in The Hague half has disappeared again. That means that only a quarter of the 9.3 kilometre route has survived. People crossing the Koningin Emmakade/Waldeck Pyrmontkade. The Demonstration Cycle Route used to be here. There is still a lot of cycling, but there no longer is specific cycling infrastructure. 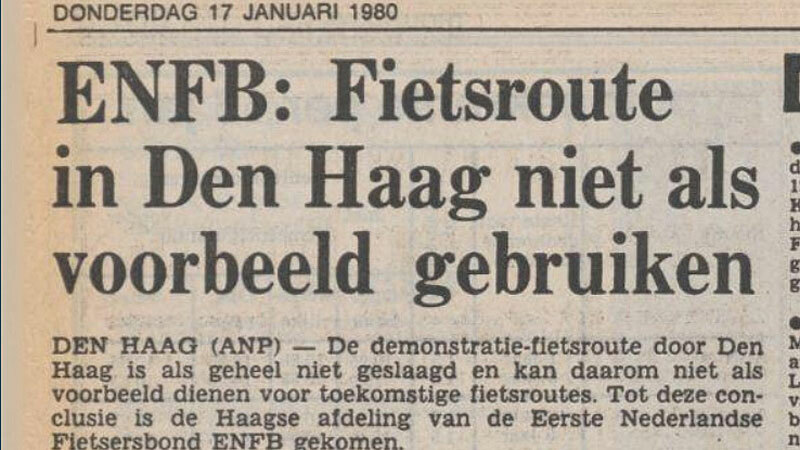 The Minister of Transport, Tjerk Westerterp, had chosen The Hague and Tilburg for a trial with so-called Demonstration Cycle Routes in September 1975. The Minister wanted to test such routes in a large and a mid-sized city. 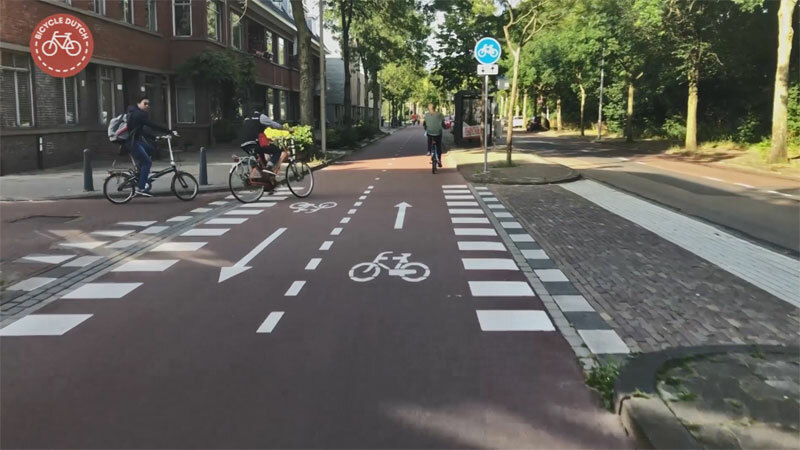 Both The Hague and Tilburg were already planning to improve their city for cycling. 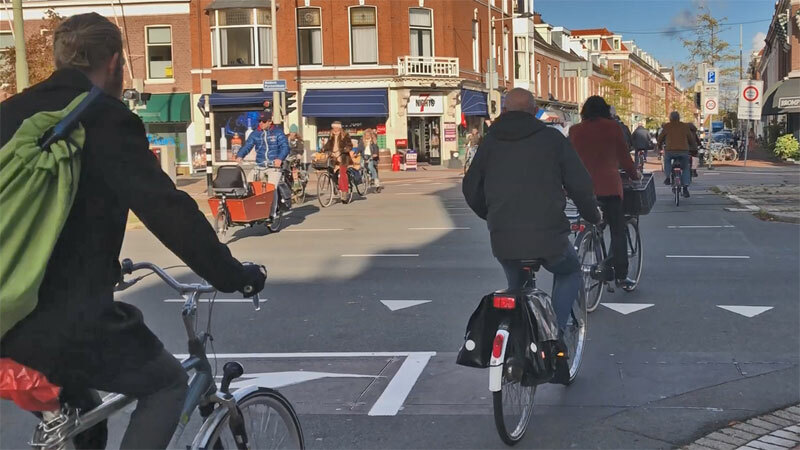 The Hague had for instance already mentioned in its Traffic Circulation Plan of that same year 1975 that it was “necessary to develop a network of cycle routes […] the routes must make it possible to cycle to work, to cycle to the shops and to cycle for recreation”. The cycleway on Mient was the first part that was built in 1976. It is one of the few remaining bits of the original Demonstration Cycle Route today. Just weeks after the announcement shopkeepers along the route in The Hague responded. They saw it as a threat to their business, expecting “large sales reductions inevitably leading to business closures and bankruptcies”. They feared, that “due to a restriction of the car traffic a large part of the buyer public will go to more accessible shopping centres”. They said they would demand compensation. This fierce resistance of the shopkeepers was newsworthy and therefore I could find a lot of information about the development of the route in the newspapers of the time, a lot of which can be found on the internet today. Recently Herbert Tiemens took part in an exchange project. He is a cycling expert working for the province of Utrecht who does a lot of internationally visible work. He swapped his workplace for 6 weeks for one in Copenhagen at the bureau “Super Cykelstier” (Cycle superhighways). One of his new colleagues there, Ulrik Djupdræt, had a surprise for Herbert; a Danish film from 1989 showing cycle developments in Copenhagen. The 21 minute film “Cykelmagt 1+2” compared the Copenhagen streets of 1978 to those of 1988. But the film also contains a very interesting section that shows Danish filmmaker Leif Larsen visited the Demonstration Routes in The Hague and Tilburg in 1978. Moving images of these cycle routes shortly after they were finished are rare and Herbert had the idea that I could do something with these images. I used snippets of the film to compare the original state of the route in The Hague with how it is today in this week’s video. In October 1975 it was expected that the estimated 10 kilometre long “Super-Cycle Route” could be built for 10 million guilders (about 4.5 million euros). Within one month the shopkeepers of Prins Hendrikstraat came with an alternative plan and route. Not through their street but in a main street parallel to it: Elandstraat. A, in hindsight, amusing remark was made at an information meeting. “Wherever this route may be built, please don’t make it red! Red means danger and don’t we all seek peace and security?” The so-called “Municipal Road Laboratory” had a different view: “the route will be red because that will increase recognisability and it will give the route a friendly appearance”. What a shock it must be, to this person, that almost all the cycling infrastructure in the Netherlands is red now. Weimarstraat. 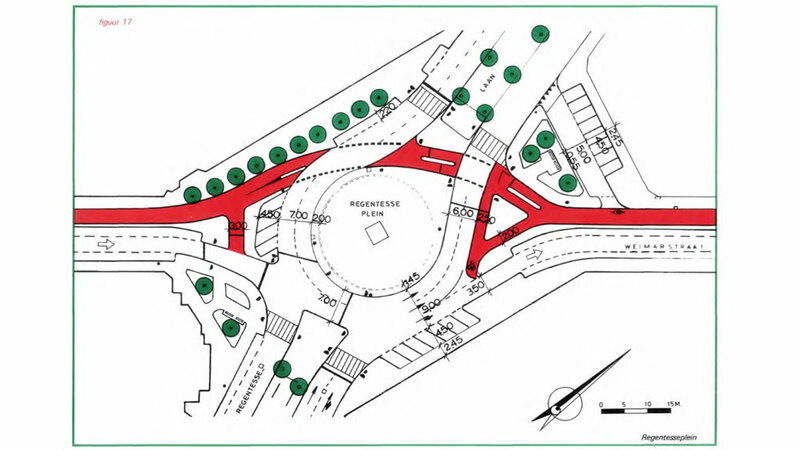 The cycling infrastructure looks very complicated. This part of the route was demolished around the years 2001/2002. This part of Weimarstraat is now a 30km/h zone that does not require separate cycling infrastructure. Picture: Dienst voor de Stadsontwikkeling, collectie Haags Gemeentearchief. 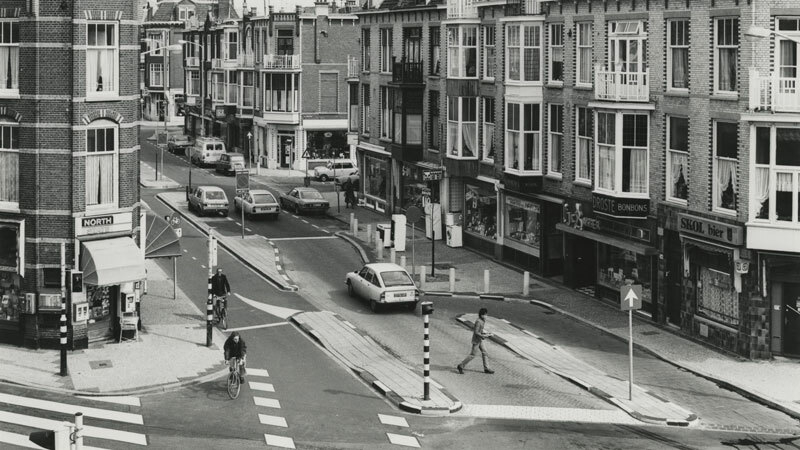 On March 15, 1976 the city council took the final decision about the route on Alberdastraat and Mient, and a preliminary one about the rest of the route. Detailed decisions of the further route were supposed to be taken bit by bit in the months to come. The retailers (supported by the local Chamber of Commerce) repeated their demand for a compensation for their loss in income. The council did not respond to that demand, instead the alderman announced: “This Demonstration Route does not stand on its own. 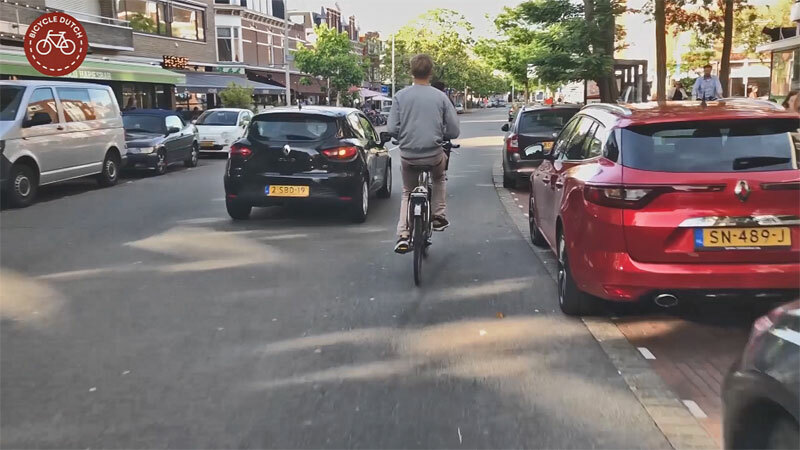 It is but a part of a series of measures which will inhibit car traffic in favour of cycling and Public Transport.” ANWB, the Motorists’ Club, seemed to agree that was indeed necessary. In their magazine of April 1976 they wrote: “if you create a bicycle route to promote the use of the bicycle, measures will have to be taken in other sectors of the traffic policies as well. Measures which must be coherent, coordinated and which must all lead to achieving a specific objective – in this case, the promotion of urban cycling”. 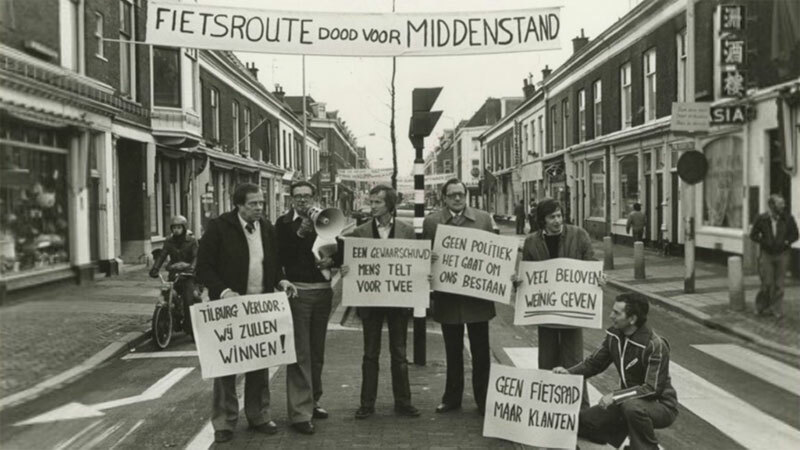 Shopkeepers protesting in Prins Hendrikstraat in April 1979. The top banner reads: “Cycle Route kills small businesses” then the held-up signs from left to right: “Tilburg lost: we shall win!”, “Forewarned is forearmed”, “No politics, it’s about our livelihood”, “Much promissed, little given” and finally the bottom one: “No cycleway but customers”. Photo: R. de Hilster, collectie Haags Gemeentearchief. The cycleway in Piet Heinstraat was removed. The street is now in a 30km/h zone. That means there is no separate provision for cycling. A newspaper article asked: “Is it all really necessary, such an expensive project, to make the life of the cyclist more pleasant?” The Cyclists’ Union at the time thought it wasn’t. “People think in auto-terms” they said. For years, they had been advocating for low-cost interventions for cycling. Such as allowing cyclists to make a right turn on red, or allowing them to enter a one-way street from the forbidden side. 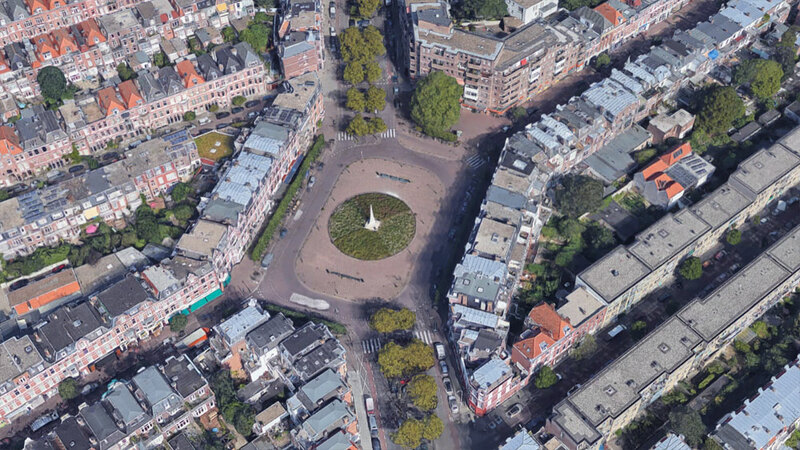 Regentesseplein today (Google). The rectangular shape of this place is now much more visible in the street-design. Part of the route was opened on Saturday 3 September 1977. Like he had done in Tilburg, the Weimarstraat part of the route was opened by minister Westerterp himself. He rode in a cycle taxi with dozens of children who had decorated their bicycles. The newspapers claimed the route (that had already been in use prior to the official opening) was not as safe as it was supposed to be. They presented a few anecdotes to prove their point. Pedestrians would not be accustomed to crossing twice; the roadway and the cycleway. People would suddenly step on the cycleway from behind parked cars. Motorists would swing their doors open without looking, forcing cyclists to swerve to the other side of the cycleway. Motorists would be causing annoyance as they apparently did not intend to take a step back. When a refuse collection vehicle blocked the street, by driving slowly to collect the waste from the bins, motorists would quickly drive past on the cycleway. Loading and unloading would take place by parking motor vehicles for longer periods on the bike path. Not only the local press had doubts. The retailers continued to complain about the alleged drop in their sales and they felt they weren’t noticed by the council. Their annoyance lead to unexpected and unprecedented events in the Prins Hendrikstraat in May 1979. Shopkeepers hired professional road workers who started to take out the cycleway – illegally – in the middle of the night. The police did issue fines to the shopkeepers, but in the afternoon of the following day the cycleway had been transformed into an illegal parking lane. The owner of a flower shop (who had personally helped to remove the kerbs with a crowbar) was confronted by a journalist. His response: “Don’t tell me we acted in an undemocratic way. We talked numerous times with the council, we complained continuously in the two years the route was here about our declines in sales. We warned them we would take matters in our own hands but they wouldn’t listen.” The alderman for traffic was called in the middle of the night to try to stop the shopkeepers by talking to them, but to no avail. “We told the alderman we wouldn’t do it if she’d promise to change the route, but she couldn’t do that on the spot.” The following day confused cyclists found cars parked on what had been a cycleway just a day earlier. The police said they would not ticket drivers parking in the illegal parking lane. 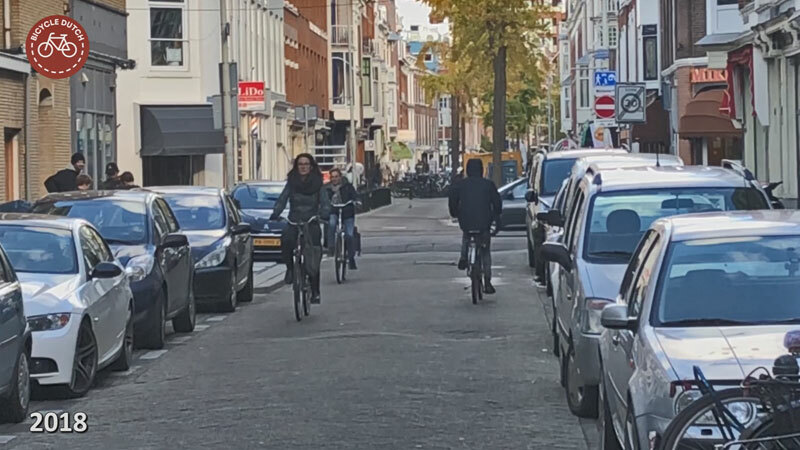 The cycleway was restored provisionally but just weeks later the right-wing parties in the council decided to give the shopkeepers what they had always wanted: the route was diverted around their shopping street and instead built in the busy Elandstraat. Theresiastraat. The Demonstration Cycle Route was planned here in 1975 but the route never reached this point. The street is a 50km/h street without any cycle provisions. That is against the Sustainable Safety policies. There should at least be an on-street cycle lane, but a separate cycleway is preferred. With the history of the Demonstration Route in mind it will not be easy to convince stakeholders in this street of that necessity. An alternative could be decreasing the speed limit to 30km/h. Streets like this are becoming increasingly rare in The Netherlands. Unfortunately, The Hague has many. 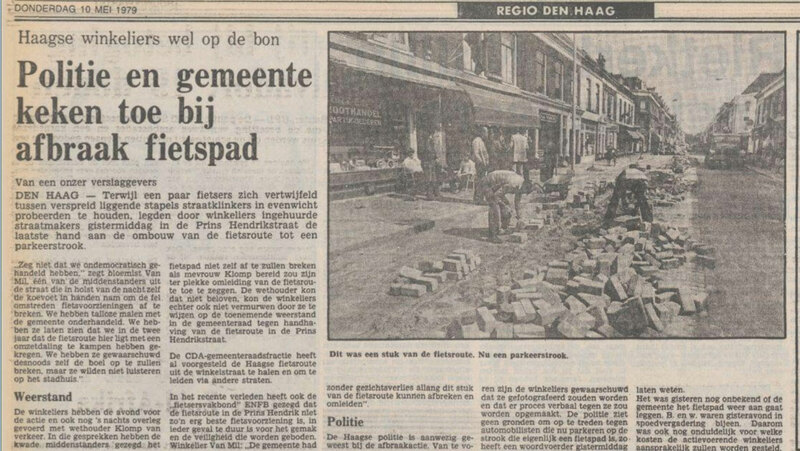 By 1980 it was already clear that the Demonstration Route in The Hague would never be finished. Although people cycling were happy with what was built the fierce resistance of especially shopkeepers made the council hesitate to take further decisions. By that time the city no longer had a right to subsidies of the national government. The procedures had taken too long. Especially the shopkeepers had protested with their claims of income loss, even though it was proven they were wrong. Investigations had shown that the cycleway was not responsible for their sales decline. That decline had started long before the cycleway was built. Most important cause: the changed demographics in the neighbourhood, where affluent families had left. These families were replaced by people of lower-income classes who preferred shopping in the then upcoming supermarkets. 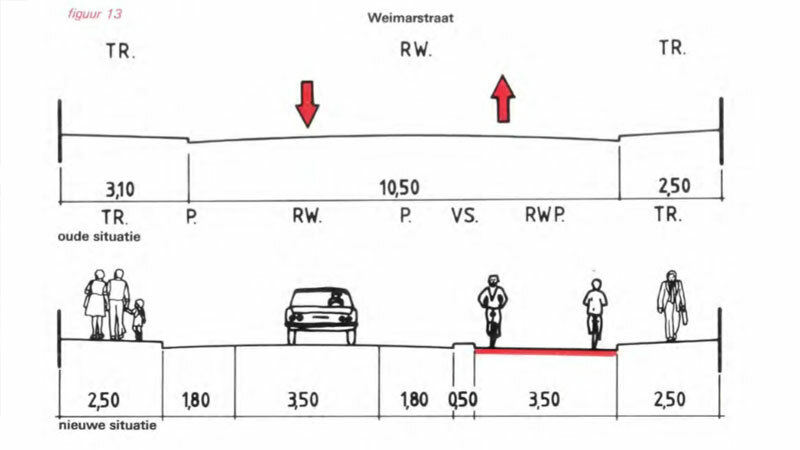 “Cyclists’ Union: Cycle Route in The Hague not to be used as an example. The Demonstration Cycle Route in The Hague is – as a whole – not a success and can therefore not be used as an example for future cycle routes. To this conclusion came the Hague branch of the Cyclists’ Union.” From Trouw, 17 January 1980. The Demonstration Route. The green line is the only surviving part (25%). The purple line represents the part that was never built (53%), in red the part that was removed again (28%). In the centre there were several options. It is a bit unclear what was built and what wasn’t. In the video I cycled a slightly different route in the centre, of an earlier plan (black line). The Cyclists’ Union kept saying the route was not good enough. There were shorter routes that could be chosen. The Union advocated for a new project in a medium-sized city with cheaper solutions to remove bottlenecks. In the end you would achieve more that way than with these expensive Demonstration Routes: improve the cycling climate in a city. In 1980 the route should have been built in Theresiastraat. But the alderman at the time did not want to do that anymore. “We no longer get subsidies and above all we expect a lot of trouble with the shopkeepers.” Instead he decided to build one-way cycle paths alongside the main road in this area: Bezuidenhoutseweg. That is indeed where we can still find the cycleways today. If you plot a route between the beginning and end of the Demonstration Route (9.3km) in the Routeplanner of the Cyclists’ Union you get a more direct route (8.8km) that is mostly on cycleways next to arterials. Parts of the route that were built, in Weimarstraat, kept annoying the shopkeepers there. The city made plans to remove the cycleway and turn the street into a 30km/h zone. That plan was finalised in 1999. The reconstruction took place in 2001 and 2002 and cost the city 1.7 million euros. The parts of the route further away from the centre, on Mient and Albardastraat, are still there and well-used. But even this four metre wide red asphalt cycleway was under threat to be removed! In 2015 the city decided to change part of this cycleway on Mient into a parking lane. Fortunately the alderman changed his mind after residents protested against this plan. In January 2017 the alderman reversed the decision and decided to keep the cycleway after all. The Demonstration Cycle Route in The Hague may seem very unsuccessful, but a lot was learned from the experience. It is not a good idea to have elaborate cycling infrastructure in back streets. That type of infrastructure is better in place on main roads. Back streets are better off with traffic calming. Speeds and volumes of motor traffic must be reduced to improve liveability there. But most of all it is clear that one route – however well designed – can never change the entire cycling climate in a city. This was confirmed by the Demonstration Project in Delft in the 1980s. There the entire cycle grid was upgraded and missing links were completed. This made clear that improving a cycle grid is the way to improve cycling. As I wrote earlier, The Hague is currently not doing too well when it comes to cyling. Its modal share only ranks 17th, when looking at the 22 largest cities in the Netherlands. Maybe the struggles the city went through with this Demonstration Route may actually have set back the city, instead of advancing it. My video about the Demonstration Cycle Route in The Hague. Video showing the ride on the (former) Demonstration Cycle Route in The Hague. Are you aware of any devices like a “bicycle canopy” but is enclosed, easy to install and provides protection from rain, wind and cold? Something with a heater inside would be ideal. I am looking for something for long winter rides. All those royalist street names reminded me of your own account of how the young Queen Wilhelmina fought and lost a court case, no less, to be allowed to ride a bike. Funny place, The Hague. This could be word-for-word truly spoken in Australia today. There’s no point relying on these “professions” to make the necessary changes from within, change must be forced on them by democratically-elected people ordering them to do as they are told. And shopkeepers in Australia spout exactly the same incorrect anecdotes as these Dutch shopkeepers did in the day. They are the most unreliable sources of good evidence for anything, which is why a large fraction of them everywhere are always going out of business. Amazing situation with the clandestine destruction of a public asset, condoned by police who just stood and watched. I would never have imagined this could have occurred in the Netherlands. That they were male-dominated and the city spokesperson was a woman (apparently) makes me think now outdates sexism was also in play. I had to check the source to see that it actually was the ENWB (now the FietsersBond) that you translated as the “Cyclists Union”, who had the policy position of only wanting small changes to improve cycling in The Hague. It sounds more like the position the ANWB (ie Motorists Club, despite what the acronym AWNB literally stands for). Great story Mark. Certainly blows the “Dutch cycling culture” myth out of the water. The Cyclists’ Union had several names in the beginning. ENWB was a teasing referal to the ANWB not doing enough for cycling. ANWB didn’t like that and went to court over it and won. That is why the Cyclists’ Union then became ENFB and later Fietsersbond (Cyclists’ Union) what it is now. Regarding the female alderman for traffic and all the protesting men. One of the sources said that on that night “she was whimpering and begging the men to please stop the destruction”, which sounded very sexist indeed. So interesting and informative! Thanks! 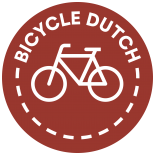 This entry was posted on 13 November 2018 by Bicycle Dutch in Original posts and tagged before and after, Den Haag (the Hague), history, long distance cycle paths, ride.